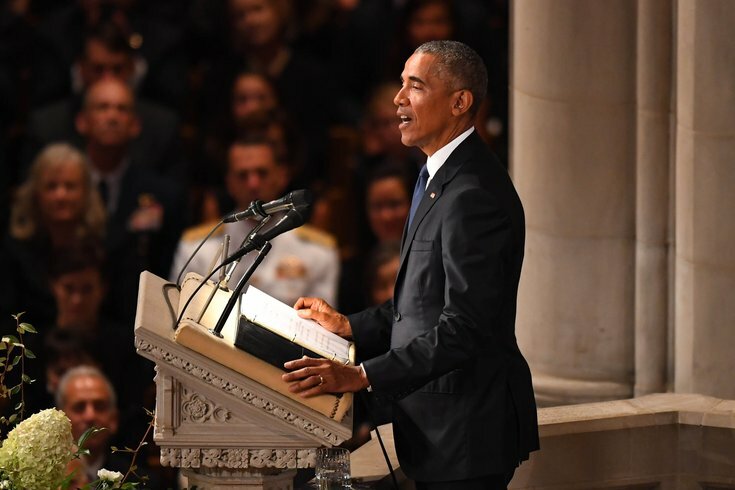 Former President Barack Obama speaks during the memorial service for John McCain on Sept. 1, 2018. Obama will be in Philadelphia on Sept. 21, 2018 to support the reelection campaigns of Pennsylvania Gov. Tom Wolf and Sen. Bob Casey. Former President Barack Obama will be in Philadelphia on Friday campaigning for Gov. Tom Wolf and Sen. Bob Casey as they run for reelection this fall. According to KYW, the doors for the rally will open around 2:30 p.m. Obama will take to the stage around 4:45 p.m.
Friday evening Obama will attend a fundraiser for Casey. Obama also is scheduled to stop in Cleveland and New York, among other areas, in support of Democratic candidates in the midterm elections. Obama's visit to Philadelphia coincides with Donald Trump Jr.'s visit to Hershey, also this Friday, where he will attend a state Republican fundraiser as the keynote speaker. In the Philadelphia area, Democrats are hoping to flip four U.S. House seats and more than 12 state legislative seats on the ballot. Casey and Wolf are currently leading the polls for their respective races.